Commercial linkage fees are charged to developers of new office or retail properties and used to fund the development of affordable housing. Sometimes called jobs-housing linkage fees, these fees are typically assessed on a per square foot basis. Arlington County assesses a commercial linkage fee of $1.77 per square foot, which was expected to generate almost $14 million in revenue between fiscal years 2013 and 2016. To give its program more flexibility, Arlington also allows commercial developers to build units if they prefer. Boston has one of the oldest commercial linkage programs in the country. It charges about $8 per square foot of new commercial development for the provision of affordable housing. While recent data is not available, between 1986 and 2000, Boston’s linkage fees generated $45 million in revenue, which funded nearly 5,000 affordable units. To address concerns over concentrations of poverty, Boston requires at least half of its fee revenues to be invested in neighborhoods that have less than the citywide average of affordable housing or have a demonstrated need for producing or preserving affordable housing. Who bears the cost of linkage or impact fees? Mostly landowners. There is general agreement among economists that much of the cost of impact fees on new development are ultimately born by landowners who have to accept lower prices for their land from developers who now face a new expense. Most of the research on impact fees is focused on fees to finance public services or infrastructure. The economics of these fees are slightly different because they are seen as funding services that the buyers of homes would value. There are empirical studies showing impact fees resulting in higher home prices and other studies showing fees driving down land prices instead. Researchers debate whether any home price increases are the direct result of the fees or the indirect result of increased demand driven by the infrastructure improvements that the fees finance. Under the right circumstances, off-site production with in-lieu fees or linkage fees can result in more affordable homes than on-site production. However, increased production is not automatic. The availability of land for development of affordable housing. Even when all these elements are present, successful off-site strategies require careful attention to unit locations in order to achieve some level of economic integration or fair housing outcomes. Can fees offer more flexibility? Yes: Inclusionary program administrators often value the flexibility that in-lieu fees or linkage fees can offer. Fee revenue can be used to produce units that are outside the operating parameters of the inclusionary housing program, such as lower AMI units, special needs housing, homeless housing, or transitional housing. This can be invaluable to the community especially if other funding sources are limited. Fee revenue can also be used to balance the outcomes. For example, if the program is primarily producing affordable for-sale units, the fees can be used to produce affordable rental housing. Or if development is concentrated in one area, the fees can be used to provide affordable housing in areas where no development is occurring. Fees can also be used to pay for capital improvements or to preserve affordability of existing properties. What are the steps in enacting a linkage fee? 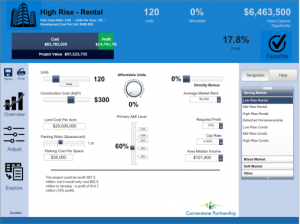 Consider a performance option for residential projects. Even for primarily fee programs, the city can offer developers the option of providing units on site in lieu of paying the fee. An on-site or off-site performance option might appeal to certain developers who want to closely and publicly associate with the provision of the affordable housing that their project generates. Is an on-site inclusionary requirement better than a housing impact fee? An increasingly popular alternative to inclusionary housing programs is to charge a housing development impact fee on new residential development to pay for affordable housing. Typically, fee revenue is deposited in a housing trust fund and used to facilitate construction of additional units for low- and moderate-income households or to achieve other affordable housing goals. There are some advantages to housing impact fees. In many states that prohibit mandatory inclusionary housing programs, it is permissible to charge fees. Additionally, housing development impact fees have the same advantages as in-lieu fees: they offer flexibility and can be used to leverage other sources of funding, like Federal Low Income Housing Tax Credits. They also face some of the same challenges. For example it is important to make sure the money is not spent primarily in low-income neighborhoods. To enact a housing development impact fee, cities must first conduct a nexus study that shows the relationship between new housing or jobs and the need for affordable housing. While a nexus study documents the maximum legal fee, a second study, called a feasibility study shows what fee levels will not adversely impact development. The legal environment is different in every state and it changes rapidly. It is important to consult with an attorney to fully understand if housing development impact fees are permitted in your jurisdiction. What is the best way to set the level of a linkage or impact fee? Generally communities commission a nexus study to determine the extent to which new development (residential or commercial) contributes to the need for affordable housing. They use the results of this study to determine the exact dollar amount of any linkage or impact fee. Residential linkage fees can either be a set price for each new home or can be calculated based on the square footage of the new home. On the lower end, Mountain View, California charges new residential development $10 a square foot, while Santa Monica, California charges approximately $28 a square foot. Berkeley, California charges $28,000 for each new market rate home to fund affordable housing. Boston, Massachusetts has one of the oldest commercial linkage programs in the country. It charges new commercial development over $8 a square foot. From 1986-2000 Boston generated $45 million in linkage fees, which funded nearly 5,000 units. * Arlington County, Virginia also has a commercial linkage fee of $1.77 a square foot, which was expected to generate almost $14 million in revenue between fiscal year 2013 and 2016. Commercial linkage fees often vary depending on the type of development (office, hotel, industrial). For example, Menlo Park, California charges almost $15 a square foot for office developments and just over $8 a square foot for industrial and other uses. When is a Nexus study necessary? 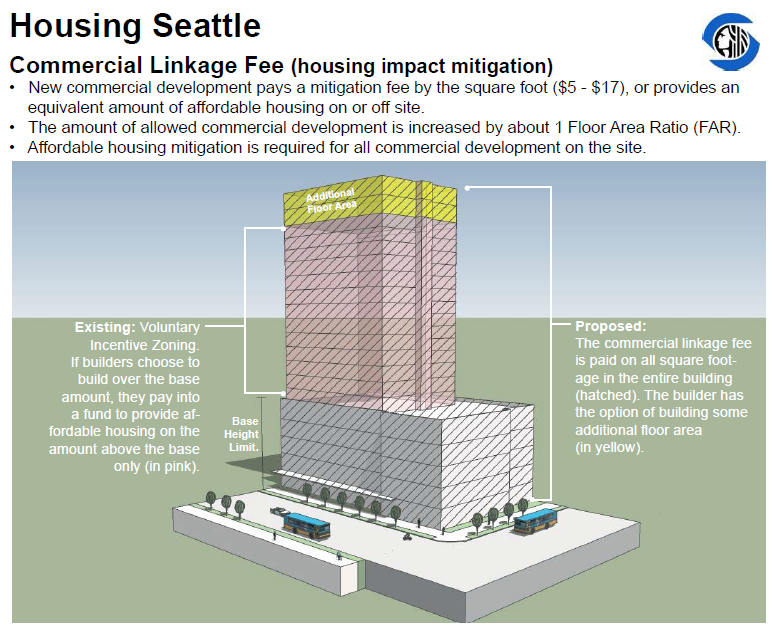 A linkage fee is intended to mitigate the impact of a given development on the community. That’s why it is important that the fee be established based on the measurable contribution of a likely project to the overall need for affordable housing. A nexus study is the established methodology for making that connection. The nexus study should focus on likely residential and commercial project types in the targeted higher-growth neighborhoods. The study will establish a maximum fee that would be consistent with the housing need created by new development of various types, but the city could choose to set the fee at a lower level if the maximum allowable fee would negatively impact development. What can jurisdictions do if their state does not allow rental inclusionary zoning? There are a number of options for states that do not allow cities to use rental inclusionary zoning. This situation usually arises because the legislature or a court has decided that inclusionary zoning is a form of rent control. At least six states (California, Colorado, Texas, North Carolina, Oregon, and Wisconsin) do not allow cities to require developments to provide rental inclusionary homes. This has created a situation where condominium projects must provide affordable housing, but not rental developments. The specifics are different in all states so it is important to check with local attorneys, but there are a number of strategies that other cities have used. Before this can be done, a nexus study must be conducted. Impact fees work well in areas with high home prices because the nexus study shows a strong connection. Cities with lower housing costs will only be able to legally justify a more modest impact fee level. Some cities have set the impact fee as the default requirement and allowed developers to choose to provide rental units as an alternative. Because the default option is paying the fee and developers are choosing to provide the units, it may be more likely to withstand a legal challenge. When implementing the impact fee, it is a good practice to offer developers flexibility as well as incentives to participate. This will both make development more likely to happen and also reduce the likelihood of a successful court challenge. In some states, it is possible to require affordable units when developers voluntarily enter into Development Agreements – generally as a result of receiving some specific public benefits. States generally allow housing authorities, local governments, or nonprofits to operate affordable rental developments, even where rent control is forbidden. It may be possible to partner with these groups to ensure that all development contributes to affordable housing. Boulder, Colorado requires that new rental developments provide affordable rental units on site or offsite, but the homes are owned by the local housing authority or similar agency so they are exempt from the state prohibition. The City of Boulder purchases the unit from the developer at an affordable price, and then sells or gives it to the Housing Authority or similar agency. Rental developments also have the option of providing a cash payment or dedicating land to the city.